Adam T. Rosenbaum | Colorado Mesa Univ. Adam T. Rosenbaum, PhD, received his Bachelor of Arts in History from Virginia Wesleyan College in Norfolk, Virginia, went on to earn his Master of Arts in History from Old Dominion University and his Doctorate in History from Emory University. An associate professor of history, Rosenbaum teaches Western Civilizations, East Asia and the Modern World, The International History of the Cold War, Modern Germany, The Holocaust and several other upper-division courses. Rosenbaum believes that the greatest reward in studying the past is the illumination of the present. His goal is to show how contemporary society has arrived at its current location while also confirming that this path was contested, crisis-ridden and never predetermined. He also believes that undergraduate students should experience history. This demands a sensory connection with the subject matter through the mediums of music, literature, art, photography and film. The use of these materials helps to create links with other academic disciplines, while the use of film in particular underscores the lingering significance of history within modern pop culture. Rosenbaum specializes in the cultural history of modern Europe, with an emphasis on Germany. His first book, Bavarian Tourism and the Modern World, 1800-1950 (Cambridge University Press), examines the relationship between the marketing of Bavarian tourist attractions and popular conceptions of nature, modernity and national identity in nineteenth- and twentieth-century Germany. He has also published articles about tourism in The Bulletin of the German Historical Institute, Central European History and The Journal of Tourism History. He is currently working on a second book project, an expansive history of travel from mass migrations to mass tourism. 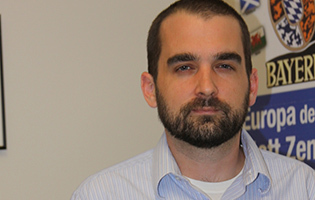 His research has received institutional support from the American Historical Association, the German Historical Institute in Washington, D.C., the German Academic Exchange Service, the Institute for European History in Mainz, Germany, and the Rachel Carson Center for Environment and Society in Munich, Germany. Rosenbaum is the co-director of the annual Holocaust Awareness Series, and has served on a variety of departmental and university committees, including the Faculty Senate Library Advisory Committee and the Academic Technology Advisory Council. In his free time, Rosenbaum is an avid traveler, and has visited more than 20 countries and more than 30 national parks.